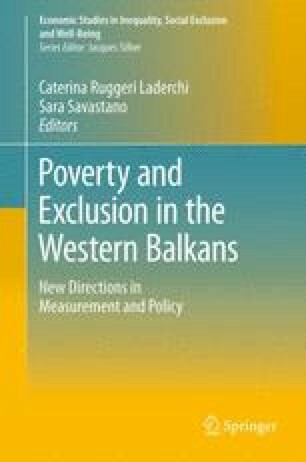 This chapter provides a comparative perspective on the design, implementation, financing, and performance of the noncontributory cash transfer programs (social assistance) across the six countries in the Western Balkan region (Albania, Bosnia and Herzegovina, FYR Macedonia, Kosovo, Montenegro, and Serbia) and benchmarks their performance against similar programs in other countries in Central and Eastern Europe. The means-tested last-resort social assistance programs that exist in all six Western Balkan countries are the primary focus of the analysis. This chapter examines their core features, taking stock of basic indicators of their scope and performance and reviewing their financing, institutional setup, eligibility criteria, main design aspects, and implementation processes in the context of the main functions of social protection—the three “P”s for resilience and opportunity: (1) prevention against drop in well-being, income, and expenditure shocks; (2) protection from destitution and losses of human capital; and (3) promotion of human capital development, opportunities, livelihoods, and better jobs (World Bank. Building Resilience and Opportunity. The World Bank’s Social Protection and Labor Strategy 2012-2022. Concept Note for CODE Review. The World Bank, Washington, DC, 2011; Grosh et al. For Protection & Promotion: The Design and Implementation of Effective Safety Nets. The World Bank, Washington, DC, 2008). The findings, interpretations, and conclusions expressed in this chapter are those of the author and do not necessarily reflect the views of the International Bank for Reconstruction and Development/The World Bank and its affiliated organizations or those of the Executive Directors of The World Bank or the governments they represent. The World Bank does not guarantee the accuracy of the data included in this work.